The musical “Bugsy Malone” with music by Paul Williams was adapted from the 1976 Film of the same name directed by Alan Parker. 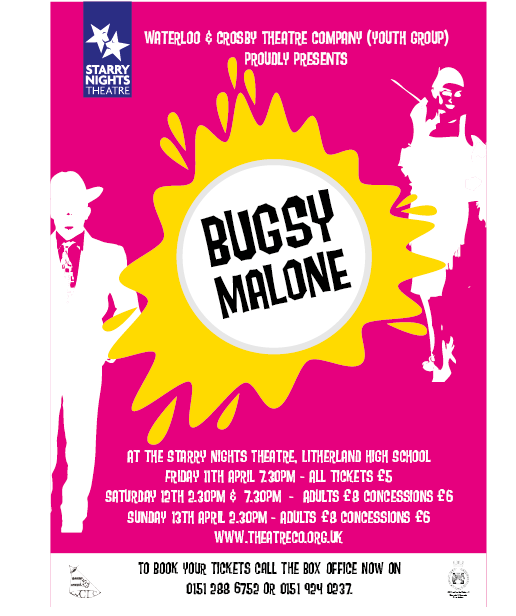 Featuring a cast of children usually up to the age of 17years, Bugsy Malone has been a favourite production for many amateur youth groups over the years. This was an enjoyable production directed by Leo Appleton with some talented young performers in the cast who all worked very well together, with lots of enthusiasm and all the cast appeared to be enjoying themselves immensely. I would like to name everybody who took part in this production as they all contributed in their own way to the overall success of this show; but as there were fifty children in the cast and a number of them played more than one part, this would not be practical. However I think it would be nice to mention a few of the leading players for all their hard work, they include, Alex Burke who gave a very good performance as Bugsy and Eboni DeGeir- Mawdsley who sang and performed very well as Blousey Brown. Lucas Frost was excellent as Fat Sam, he projected his voice well and his diction was very clear, and Adam Cusack sang and performed very well as Fizzy. Sarah Henshaw and Euan Parkes produced good characterisations as Tallulah and Dandy Dan and there was also a nice comedy duo from Captain Smolsky- Daniel Cassidy and Lieutenant O’Dreary- David Coyne. Brian Comer as Cagey Joe, Daniel Hill as Leroy and Poppy Hart as Lena Marrelli were also very entertaining. I was very impressed with how the cast maintained their American accents throughout the show; I could not hear any local inflections creeping into the dialogue which was very good considering the age of the performers. However I did find it a little hard to hear some of the dialogue at times but I am sure the art of projection will come with experience. The scenery fitted the era well and placing the Band on stage added to the atmosphere of the Speakeasy. The stage area was also used to maximum efficiency meaning quick and smooth transition between scenes and the costumes suited the roles and fitted the era very well. The Band led by Musical Director Charles “Razzmatazz” Moss played very well, were not too loud and accompanied the cast soundly. Choreography by Alex Appleton added to the production and was suitable for the age group of the performers. It was obvious allot of hard work had gone into bringing this production to the stage and this showed in the final product. Congratulations must be given to Leo Appleton for his leadership of this project and well done to all involved including the back stage crew and front of house. Thank you for inviting me, I hope to see you for your next production.